I do a lot of analysis with my resume clients. I also ask my friends who are actual hiring managers and authorities plenty of questions about who they hire and why. 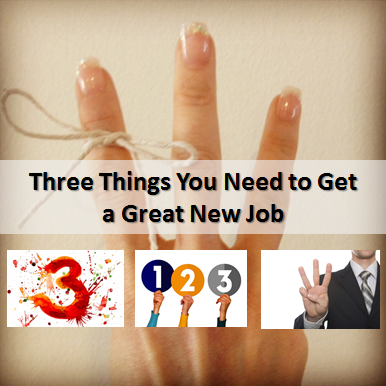 From those conversations I have determined that there are 3 commons factors you need in order to land a great job. 3. A Great Resume. No surprise that a resume writer would tell you get have a great resume but honestly, and truly, I have seen some amazing things happen to clients just because they had a nice resume. For instance most recently, a young man who I helped with his resume got offered a job in his field with little experience and the hiring manager told him that the resume won him the job. Another example is from a client who says they received a request for an interview and got the job within 24 hours of submitting their resume. I’m not trying to sell you here folks, the truth is, an attractive resume opens a lot of closed doors. 2. Some Related Experience. Sometimes we want to change careers, transition into a new career or we want a big title promotion. That is fine, however it is not easy. Although I am not the type of HR person to put a lot of stock in experience (because I believe skills, desire, excitement and education can trump experience) but I understand why most hiring managers only care about experience. Whenever a hiring manager has 2 applicants that they like, the one with the most experience usually gets the job. Experience is still Queen – yes queen, do you want to know what’s King? Keep reading. 1. Network Connections (Referrals). Your network connections are King in the job search because with great network connections you can get interviews and even hired for jobs that you aren’t even qualified for. True story, People love to refer their family members and friends. Companies love to hire referrals because they tend to work out better and longer than non-referrals. Recently, I was a guest on Chris Russell’s Career Cloud podcast with Hannah Morgan and we talked about our most recent successes – both Hannah and I had similar stories about how our latest clients had gotten job offers pretty quickly but they were referred. In an unrelated coincidence, I was talking to a hiring manager who told me she had scheduled interviews with 3 candidates all of whom were referrals from current executives. So the perfect situation is to have all three phases covered.